1. Is the roofing contractor local & how long have they been in business? A company with an established business is likely to be around when you need them. If you have a warranty, you want to make certain someone is around to honor it should there ever be a problem. 2. Make certain the roofing company is insured. This protects consumers from contractors that aren't experienced in the industry. Ask abut insurance, particularly liability and worker’s compensation. A roofer without insurance coverage can leave you open to all sorts of risk, from damage to your property to liability for personal injury. ASK FOR A CERTIFICATE OF INSURANCE. 3. Check with the Better Business Bureau. This is where you'll find those unhappy customers, if there are any. Remember that any company that deals with a larger volume of customers can get a few complaints. What's important is how they handled those complaints. 4. Look for a roofer that has good communication skills. You want someone that you can talk to about your project, that will readily answer all of your questions and that will keep you informed every step of the way. Poor communication can lead to misunderstandings and a finished job you may not be happy with. 5. Check to see if the contractor is part of the local industry associations. A strong established contractor should be a member of trade associations. In our area, it is The North Texas Roofing Contractors. 6. Avoid storm chasers. Steer clear of the knock-on-the-door, “We were in your neighborhood” roofers. This is just canvassing and selling. If you are approached by this technique, call your agent and ask for a recommendation. Pick a roofer from a referral or a sign in your area that has a satisfied client on the other end. 7. Look for a contractor who is a certified installer of the products they offer. 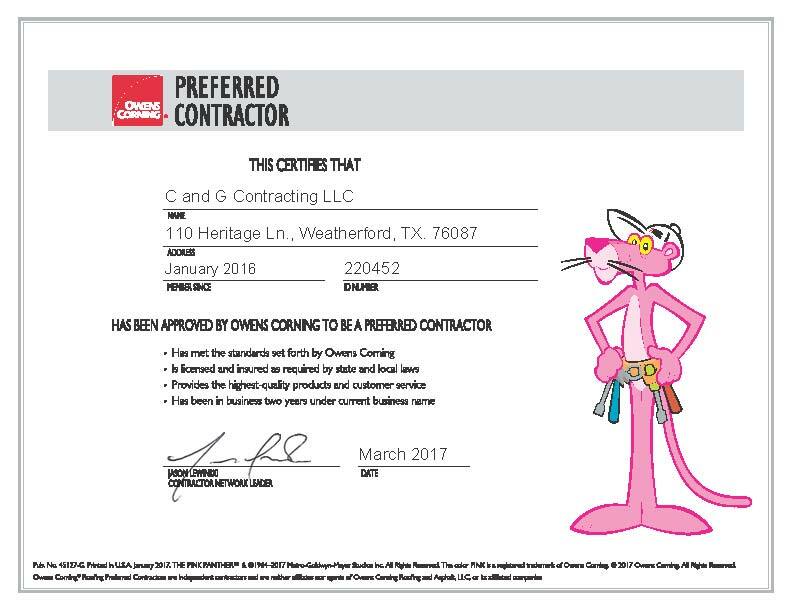 Certified contractors can offer stronger warranties on the products they install and follow stricter installation guidelines.